When breeding labrador dog litters many owners who either want to breed puppies for their own enjoyment and to stay with them or pursue breeding as a commercial operation. Whether to keep or sell the puppies produced there are a few basics that the potential breeder should know. Breeding Labrador dog litters does involve a lot of work and preparation especially in making sure that the pair chosen for breeding are suitable for the task in terms of health, age and temperament. 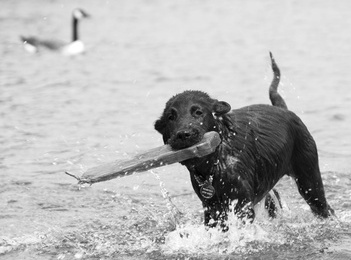 The following article discusses what is required when preparing to breed Labradors. No dog should be part of the breeding process until age 2. This ensures that important physical and mental characteristics have time to appear. Dogs with favorable qualities and genetics can then be selected for breeding. The dog's temperament and problems such as canine seizures will be apparent by age 2 to 3. Females should be full grown when selected. 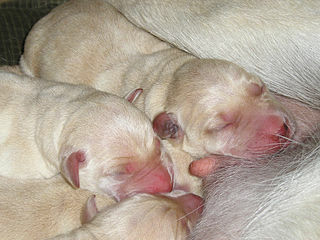 If a dog starts to breed at a younger age, they divert energy from growing into healthy adulthood into having puppies. Hips: The Othropedic Foundation for Animals (OFA) has a hip test that cannot be used until a dog is 2 years old. Large and medium breeds such as the Lab must be checked for hip dysplasia. Elbows: Elbow problems also need to be screen in labs. The OFA will review X-Rays of the elbows and make a determination about 4 to 6 weeks after receiving them. Eyes: The Canine Eye Registration Foundation (CERF) has a genetic test administered by a veterinary opthalmologist via Optigen. The test is done annually during the breeding life of the Labrador. The vet will look for issues such as eye abnormalities, ectropion, entropion, distichiasis, progressive degenerative retinas and cataracts. Heart: A veterinary cardiologist will check the Labrador for any heart issues. Other tests include Brucellosis, an infectious bacterial diseases that causes spontaneous abortions in newly infected animals. Both parents need to be tested since it is possible for the male Lab to pass it on to a female. If artificial insemination is done, the female could bass the infection to the puppies. At a female's 2 year birthday, and before breeding, right before a dog goes into heat, a veterinarian will do a physical, provide any needed vaccines, check the stool for parasites and heartworm. Weight and overall condition will also be checked. Multiple ways exist to find out when a female dog should be bred. For artificially inseminated dogs, vaginal smears can indicate ovulation. Another test, Progesterone assays can also indicate the best time to breed a dog. If you are working with an experienced male dog, then breeding can occur every other day, assuming both dogs are willing. Breeding Labradors is a major responsibility. You need to be ready to not only assess the health of the parents, but then care for the dogs and puppies during whelping. You are also responsible for finding excellent homes for the pups, which involves interviewing any new owners.